Friday’s plans included lunch with an old friend who recently bought a condo in Andersonville. Google Maps showed two options from the hotel to my friend’s new place. 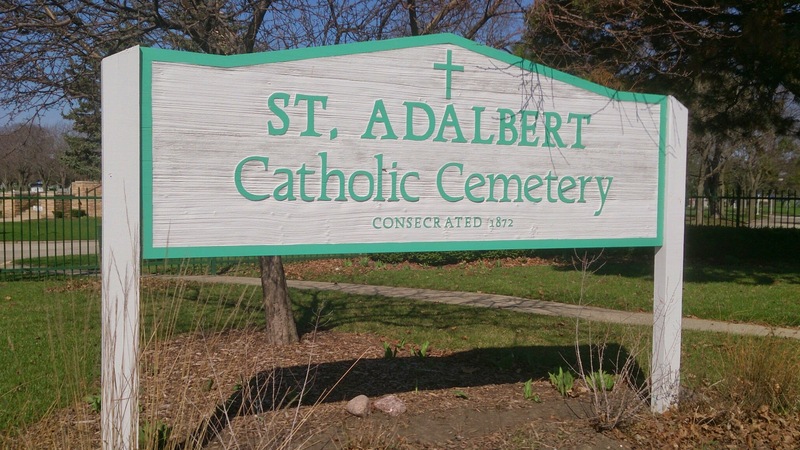 One route would bring us within blocks of Saint Adalbert Cemetery in Niles. Saint Adalbert has come up a number of times over the years on the Rootweb Cook County mailing list. Somehow I had gotten the impression it was a small cemetery. It isn’t. And oh my gosh, is it beautiful! 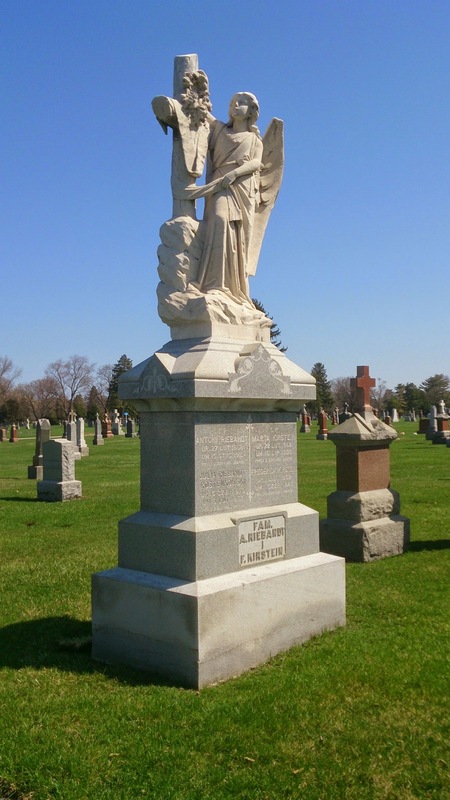 We entered the cemetery from Milwaukee Avenue and drove along a winding road awed by row after row of breathtaking monuments. At the halfway point there is a chain link fence and a gravel road. 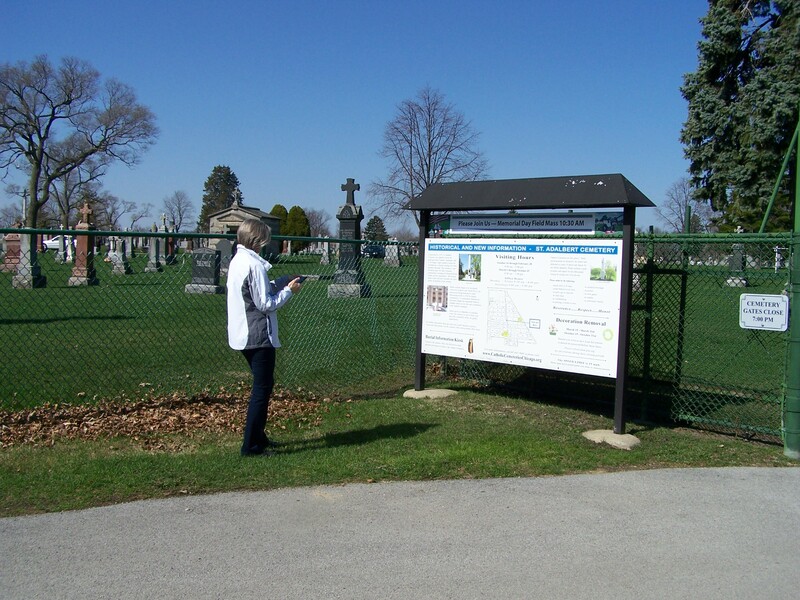 Just across the road is a sign about the cemetery and a map showing the cemetery sections. After taking a picture of the sign we drove through the gate and chose a section to photograph for Find A Grave. It was a lovely day to be outside; sunny with a mild breeze. The ground was dry and mostly even – unlike Mount Olive where we had stumbled frequently on the uneven terrain. Keeping an eye on each other and on the time, we took 492 pictures before we had to leave. We got in the car and circled back to the gravel road where we stumbled upon Norwood Park Home Cemetery. Did we stop?